Madeleine is a 5th year student in the Doctorate of Physical Therapy program at Northeastern University. She grew up as a competitive synchronized swimmer on the North Shore of Boston. 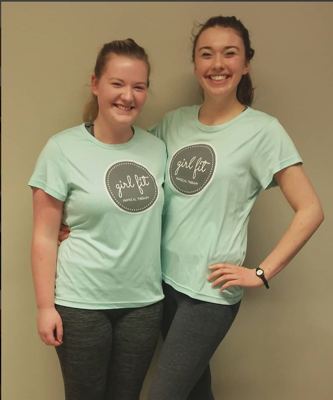 She joined the Girl Fit team in January 2018 as a 6-month co-operative education student. If you called the office or came into the clinic recently, you have probably seen her smiling face! I like to joke that my feminist awakening started when I was 9 and watched “Legally Blonde” for the first time. As a 9-year-old, I was under the impression that you could either be a girly-girl or a tom-boy. Girly-girls were pretty, popular, and conformed to societal expectations of women. Tom-boys were sporty, smart and had the monopoly on empowerment. Legally Blonde taught me that you could be both pretty and smart. At an elementary school age, this was revolutionary to my world view. Ever since my Elle-Woods-feminist-awakening, I have been on a life long journey to understand how I define feminism, and how best to use my power as a woman to help other women. An important stop on that journey was a class I took for my minor in “Global social entrepreneurship”. I traveled to India for a 6-week study abroad program that focused on women’s empowerment and development in rural and suburban India. I learned an immense amount about social entrepreneurship, Indian culture, and the best way to empower women. We visited many different organizations running different programs to address the needs of the women in their community. We visited a taxi service for women that also taught women how to drive. We visited a school that used theater to help women process and speak about the injustices they had experienced in the world, such as sexual assault, a rampant issue in rural, northeastern India. We worked with a company that taught women how to sew and then provided them with tailor jobs. The lesson I took from the successful organizations we interacted with, was that women don’t need to be “empowered”. What women need is to be given knowledge and skills that they do not already have. Research agrees. Most research in the development space is focused on resources and women’s access to those resources. Deepa Narayan of the World Bank, writes, “we see resources, however, not as a feature of empowerment per se but as… catalysts for empowerment, as enabling factors that can foster an empowerment process.”1 Empowerment, or increasing access to resources, has a positive effect on economic development, according to the American Economic Association.2 Empowerment is not necessarily telling girls they can be anything, but rather giving them better access to resources they need to succeed. Though underprivileged women in rural Ragistan, India may seem very different than the adolescent female athletes we see at Girl Fit Physical Therapy, I believe what I learned applies to the empowerment happening every day in the clinic. In middle and high school sports, girls are not given proper education on injury prevention. They are told they need to train more to be better: “everything needs to be strong!”. Research has shown that due to many barriers, children and adolescents are not given proper injury prevention education.3 Without this information, girls are at very high risk of injury from training too hard and putting stresses on their body which are unnatural. I have seen first-hand what the Girl Fit model has done for some of our patients and clients. A girl comes in with an injury from her sport and is weak in certain muscle groups, despite training 6 days a week. She has poor body mechanics, as well as low body awareness, which may have led to her current injury and also puts her at higher risk for a second injury. When she graduates from physical therapy, she has a tool box full of exercises that she can do to work the areas she needs to keep strong, knowledge of how strengthening and stretching keeps her from putting herself at risk for another injury, and understanding when her body is telling her to slow down or stop. 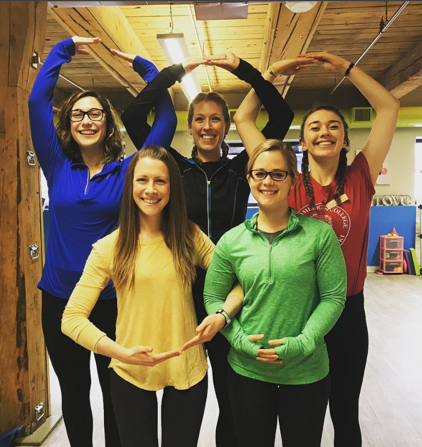 Each week, the Girl Fit team meets to talk about research in physical therapy so we can use the best exercises, best techniques, and give the best evidence-based practice to our patients. While I do not think the physical therapists even realize it, they are empowering their patients and clients based on research in development. I am proud to have been part of the Girl Fit team and to have helped improve the lives of many strong girls and women by giving them the skills and knowledge they need to take care of their bodies.